The man was identified as 29-year-old Omar Ismail Mostefai. 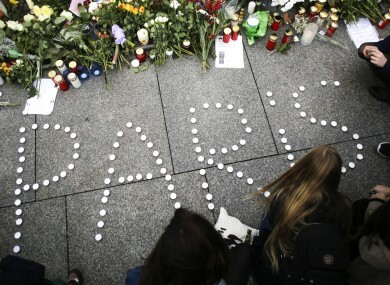 FRENCH POLICE HAVE identified the first of seven gunmen who killed at least 129 people in a wave of carnage claimed by the Islamic State group, as international investigators stepped up their probes into Paris’s worst ever attacks. French authorities last night named the first attacker as 29-year-old Omar Ismail Mostefai, who was identified from a severed finger found at Bataclan concert hall, scene of the worst of the bloodshed. IS jihadists said they were behind the gun and suicide attacks that left a trail of destruction at a sold-out concert hall, at restaurants and bars, and outside France’s Stade de France national stadium. President Francois Hollande called the coordinated assault on Friday night an “act of war” as the capital’s normally bustling streets fell eerily quiet, 10 months after attacks on magazine Charlie Hebdo shocked the nation. Meanwhile the investigation widened across Europe, with Belgian police arresting several suspects and German authorities probing a possible link to a man recently found with a car of explosives. The discovery of a Syrian passport near the body of one attacker has raised suspicions some of the assailants might have entered Europe as part of an influx of people fleeing Syria’s civil war. “We confirm that the (Syrian) passport holder came through the Greek island of Leros on October 3, where he was registered under EU rules,” said the Greek minister for citizen protection, Nikos Toskas. The attacks, which killed 129 people and wounded 352, including 99 critically, were the first ever suicide bombings on French soil. Unlike those in January, none of the assailants had ever been jailed for terror offences. Mostefai, born in the poor Paris suburb of Courcouronnes as one of four brothers and two sisters, had eight convictions for petty crimes but had never been imprisoned. Prints found on a finger in the Bataclan matched those in police files. Paris prosecutor Francois Molins said he had came to the authorities’ attention in 2010 as having been radicalised but had “never been implicated in a terrorist network or plot”. “It’s a crazy thing, it’s madness,” his brother told AFP, his voice trembling, before he was taken into custody along with his father on Saturday night. In a statement posted online yesterday, IS claimed responsibility for the attacks and referred to French air strikes on IS in Syria. A total of 89 people were killed at the Bataclan by the armed men who burst in shouting “Allahu akbar” (God is greatest) before gunning down concert-goers and executing hostages. As police stormed the venue, two of the gunmen blew themselves up, while the third was shot by police. Three suicide bombers also detonated their explosives outside the Stade de France stadium where France were playing Germany in a football friendly attended by Hollande, who was evacuated. Several restaurants were targeted, including a popular Cambodian eatery in the trendy Canal St. Martin area, where at least 12 people died. Another 19 people were killed at a busy restaurant on nearby Rue de Charonne. The seventh attacker blew himself up on a bustling avenue near the concert hall, injuring one other person. Email “First Paris attack suspect named, family members arrested”. Feedback on “First Paris attack suspect named, family members arrested”.